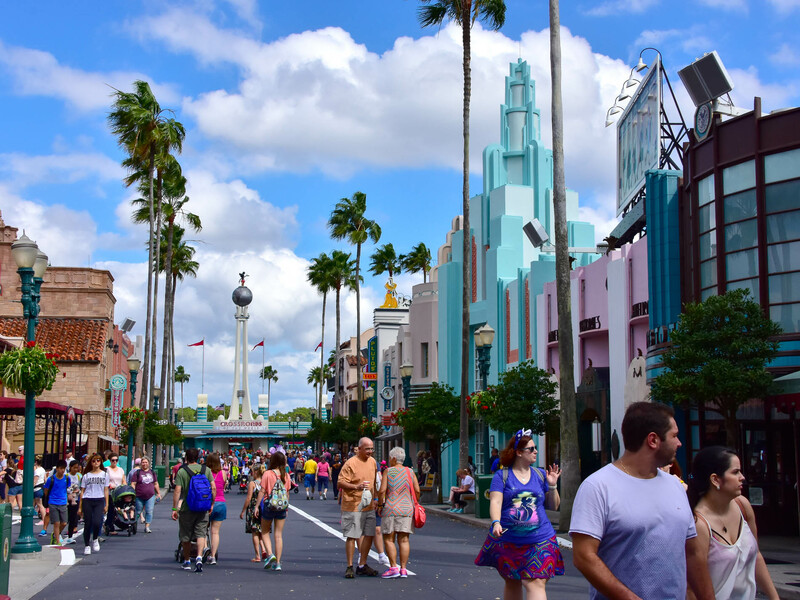 We've often said that our favorite Disney park is the one we happen to be standing in at the moment, but Disney's Hollywood Studios is one that comes to mind first when we think about that question. Being native Californians, we're always pleased with how well Disney has captured the essence of southern California, especially the ambiance of early Hollywood. Or at least, how we imagine Hollywood would have looked in the 1940s. 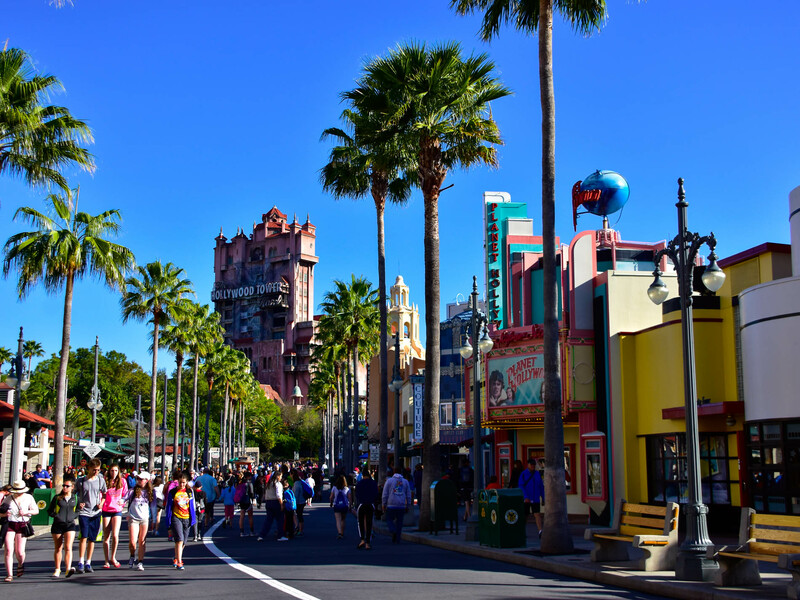 This month we're concentrating our Photo Tour on just two streets in Hollywood Studios: Hollywood Boulevard and Sunset Boulevard. These are the two main streets you'll encounter as you enter the park. Hollywood Boulevard is the street you'll be on when you first enter. It starts at the entrance gates and runs down to the Chinese Theatre. About two thirds of the way down Hollywood Boulevard, you'll come to Sunset Boulevard on the right. 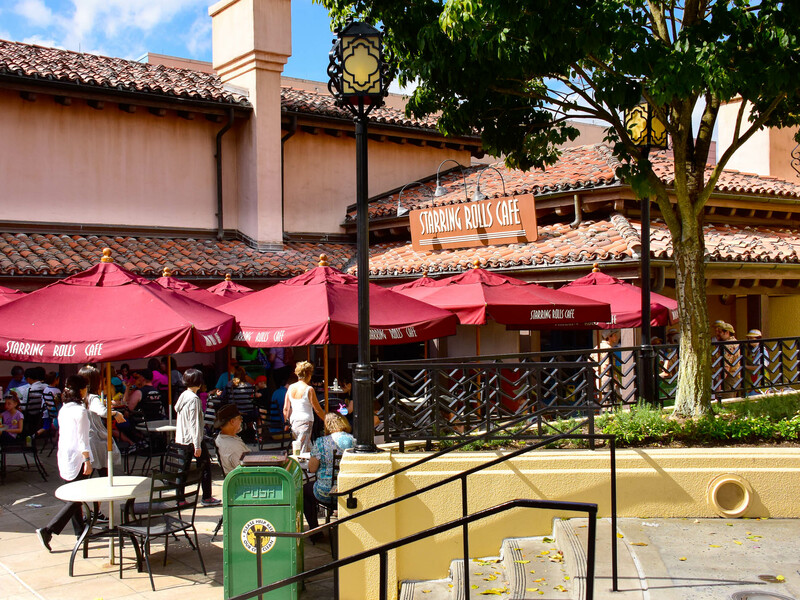 You'll find more shops, some great quick service food, and two of Hollywood Studio's iconic rides, Rock 'n' Roller Coaster and Tower of Terror. A walk down the real Hollywood Boulevard in California might take you past famous landmarks like Capital Records, the Chinese Theatre, or the El Capitan Theatre. On Hollywood Boulevard at Disney's Hollywood Studios, you'll see several great Disney shops and the park's Starbucks; at the end is a plaza where you'll find the Brown Derby, the Chinese Theatre (the home of The Great Movie Ride), and Center Stage, which hosts various shows throughout the year. Right now the primary show is Star Wars: A Galaxy Far, Far Away. 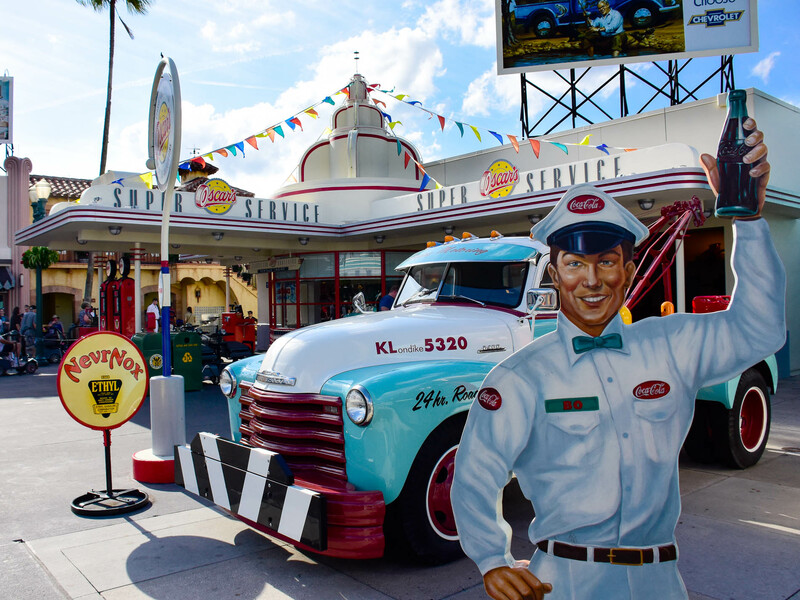 As you enter Hollywood Studios, your first taste of its appearance is Oscar's Super Service on the right. For those of us who are old enough to remember full service "filling stations," it brings back memories. It's also where you can rent scooters, wheel chairs, and strollers, and serves as a package pickup. Photo by Donald Fink. 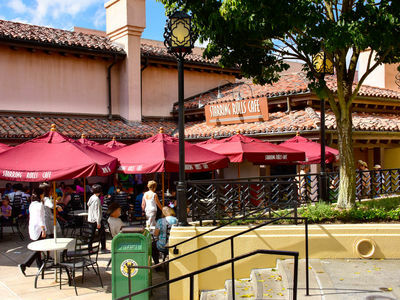 Located on the corner of Hollywood Boulevard and Sunset Boulevard at Hollywood Studios, this Starbucks store represents the newest offering from the Disney/Starbucks relationship. It's themed inside and out to look like a trolley car station. Image by Bonnie Fink. The Cameraman was commissioned by Roy Disney with artists Aldo and Andrea Fevelli in 1995. 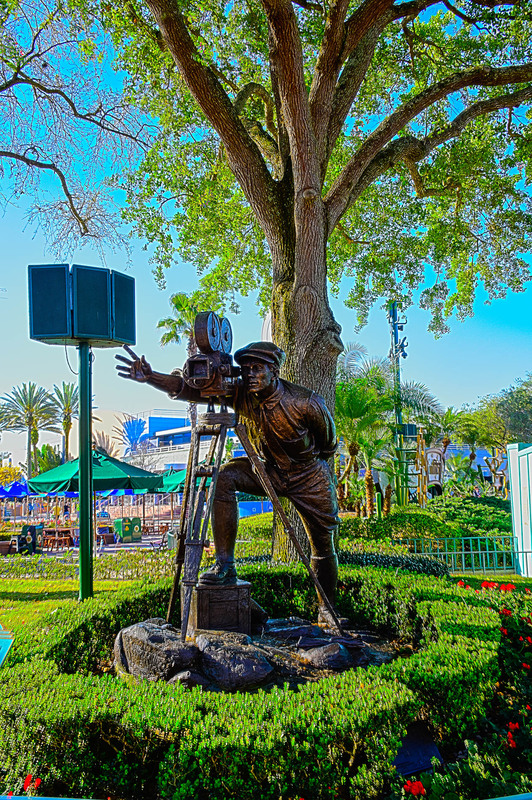 The original statue sits on West Olive Avenue near Gate 2 at Universal Studios in southern California. Photo by Donald Fink. Since the Sorcerer's Hat was demolished at the end of Hollywood Boulevard, the view as you enter Hollywood Studios is a reproduction of Grauman's Chinese Theatre, home of the Great Movie Ride. Photo by Donald Fink. The bounty Hunter, Boba Fett, uses one of his many weapons during the mini show, Star Wars: A Galaxy Far, Far Away. It's currently showing at the Center Stage in front of the Chinese Theatre on Hollywood Boulevard. Photo by Bonnie Fink. The Brown Derby restaurant sits nearly on the corner of Hollywood and Sunset Boulevards at Hollywood Studios. Photo by Donald Fink. 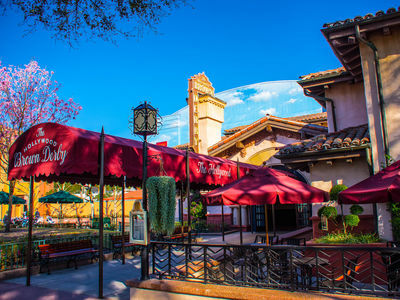 The original Brown Derby restaurant was a coffee shop with an entrance that looked like a hat. The derby was inspired by the hat worn by the then New York Governor Al Smith. There have been several Brown Derby franchises over the years. The most famous of the restaurants is on Wilshire Boulevard in Hollywood, California. 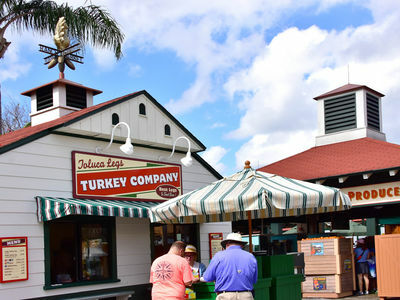 Disney licensed this location at Hollywood Studios in 1987. One of the signature dishes of The Brown Derby is the famous Cobb Salad. This dish was allegedly created by the owner of the Wilshire Boulevard restaurant, Robert H. Cobb, in the 1930s. To remember its ingredients, you can think of the mnemonic, “E.A.T. C.O.B.B.,” which stands for egg, avocado, tomato, chicken, onion, bacon, and blue cheese, then throw in some lettuce. The interior of the Hollywood Brown Derby captures the essence of the original restaurant in Hollywood, California. 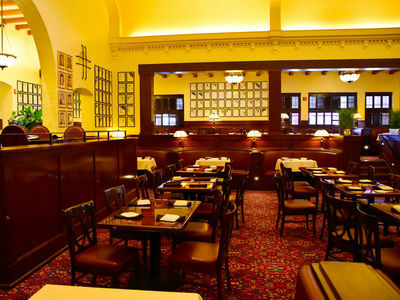 There are caricatures on the walls depicting the many celebrities who have frequented the restaurant over the years. Photo by Donald Fink. The architecture of Hollywood Studios accurately captures the essence of mid-century southern California, with the 1950s era modern buildings and the palm trees. Photo by Bonnie Fink. Turning down Sunset Boulevard from Hollywood Boulevard you can't miss the looming Hollywood Tower Hotel, the home of the Twilight Zone Tower of Terror. Photo by Bonnie Fink. Starring Rolls Cafe looks to be a seating area, but when you walk down into the seating area you discover a complete cafe in the back. It offers quick service pastries and sandwiches along with various non-alcoholic drinks. 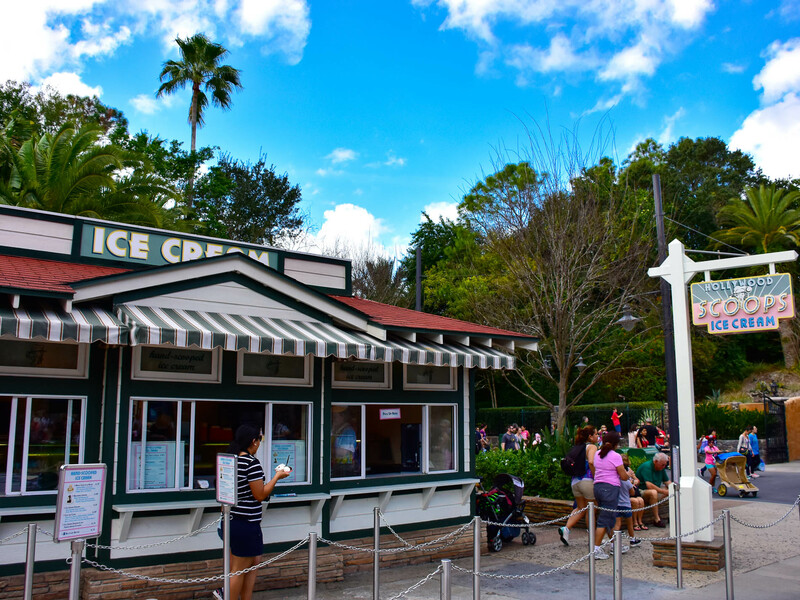 The sandwiches are big enough to share between two and the desserts are as good as anywhere else on Disney property. This cafe is located next to the Brown Derby restaurant. Photo by Donald Fink. 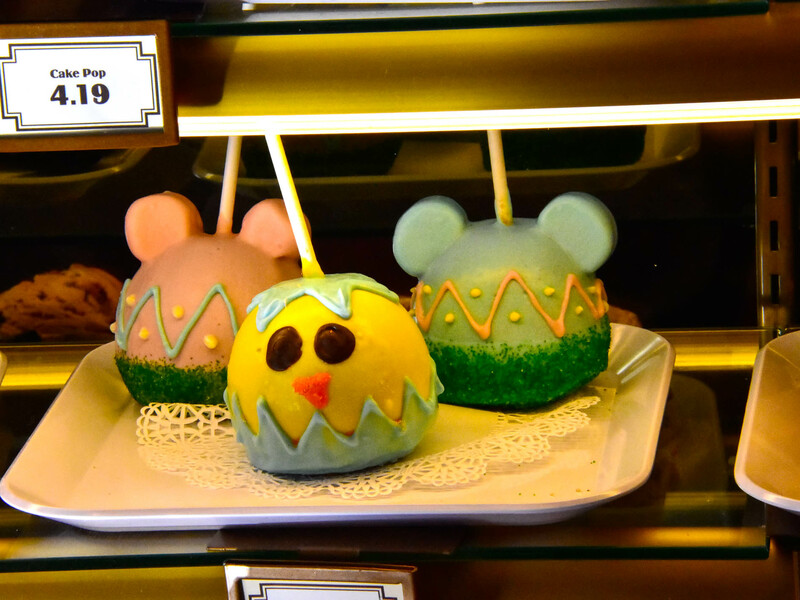 Cake Pops and other hand made goodies are at Sweet Spells, located on Sunset Boulevard next to Starring Rolls Cafe. Photo by Donald Fink. 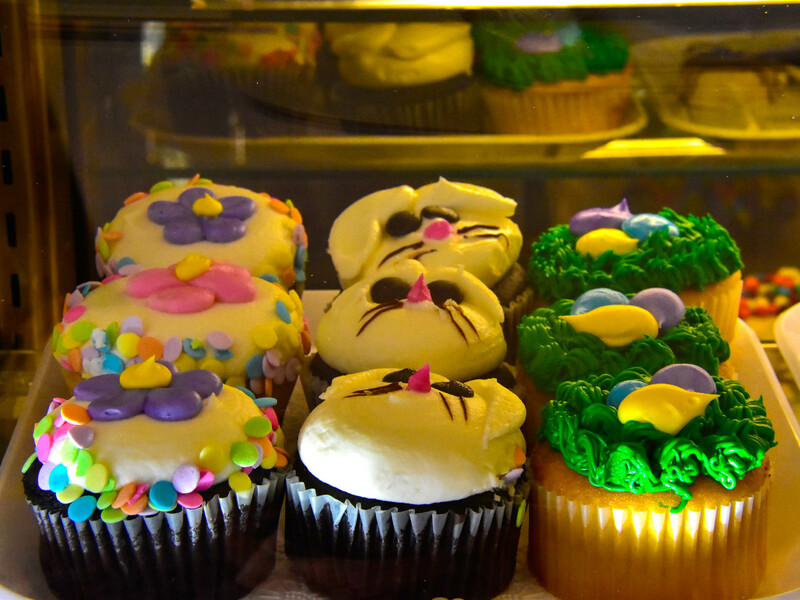 Cupcakes of all kinds are at Sweet Spells. Whether you want a candied apple, Mickey Cookie, or one of these cupcakes, Sweet Spells specializes in hand made desserts. Photo by Donald Fink. 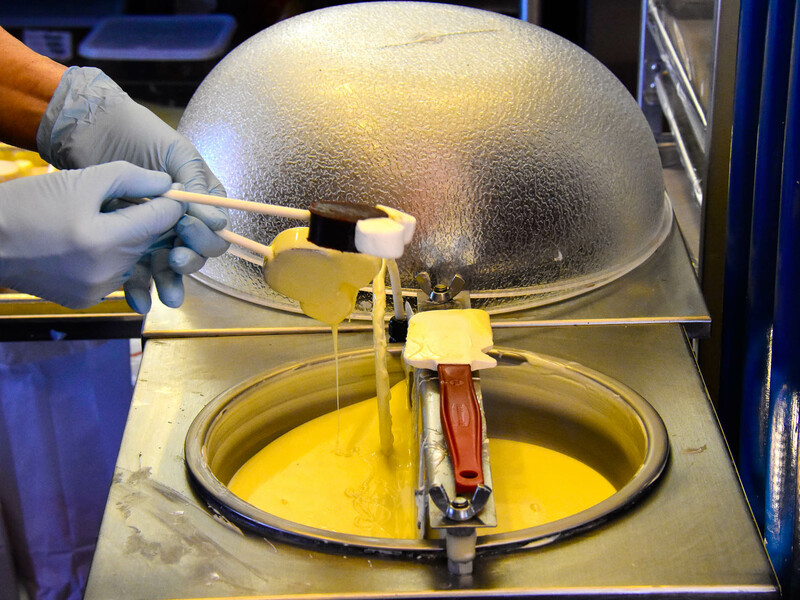 Many of the confections at Sweet Spells are hand made. Here, chocolate cake pops with marshmallow ears are dipped in white chocolate. Photo by Donald Fink. 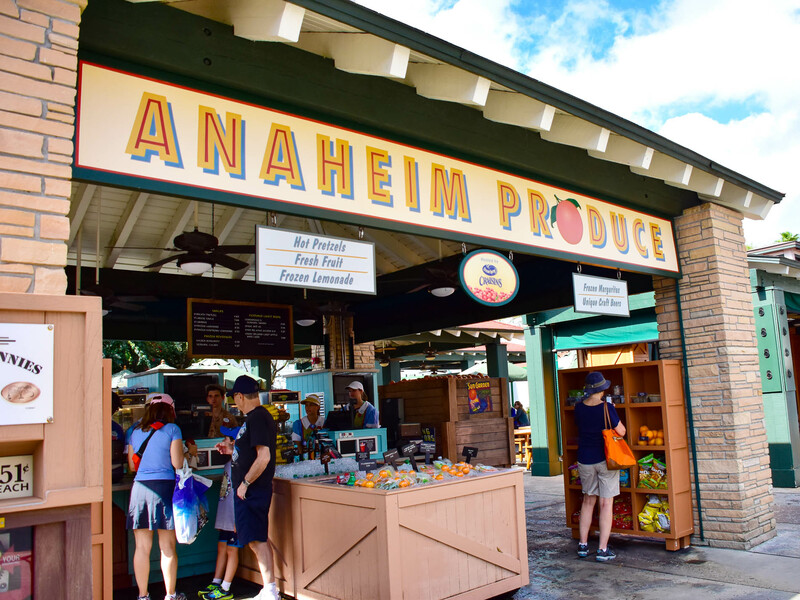 The Sunset Ranch Market is located along Sunset Boulevard on the left as you walk toward Tower of Terror. It's a mixture of several quick service food places. Here, the Toluca Legs Turkey Company specializes in those famous smoked turkey legs. Photo by Bonnie Fink. For a somewhat healthier option, the Anaheim Produce market, located as part of the Sunset Ranch Market on Sunset Boulevard, offers various fruits and snacks. Photo by Bonnie Fink. 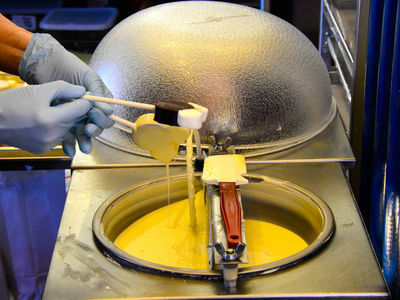 Hollywood Scoops, located at the Sunset Ranch Market on Sunset Boulevard, offers sundaes and hand-dipped ice cream. Photo by Bonnie Fink. 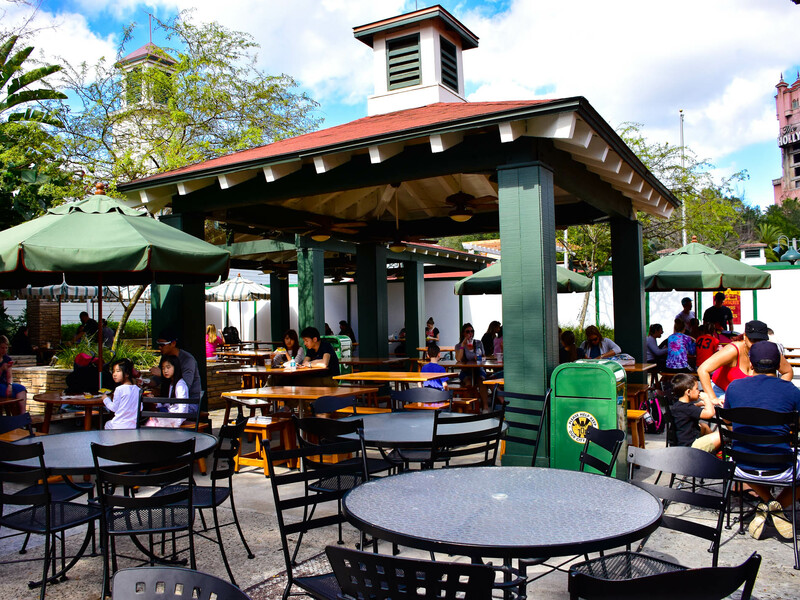 Behind the various food venues at the Sunset Ranch Market is a large seating area where guests can enjoy their meal. It gets a little crowded during peak meal times, but otherwise offers ample room. Photo by Bonnie Fink. 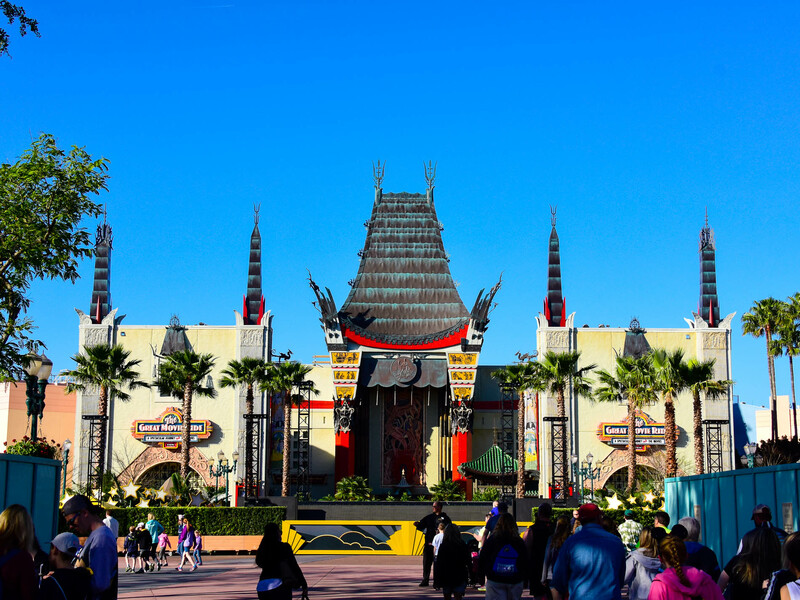 The Theatre of the Stars is located along Sunset Boulevard, midway between Hollywood Boulevard and Tower of Terror. It is the current home of a stage production of Beauty and the Beast, which shows several times a day. Photo by Bonnie Fink. The Theatre of the Stars is designed after The Hollywood Bowl in Hollywood, California. Built in 1919, the Hollywood Bowl has hosted The Beatles, Barbara Streisand, and Frank Sinatra. 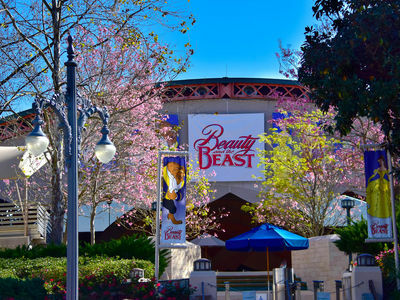 Being a somewhat smaller venue, the Theatre of the Stars in Hollywood is host to a stage version of Disney's Beauty and the Beast. At The Theatre of the Stars you can enjoy a short stage version of Beauty and the Beast. 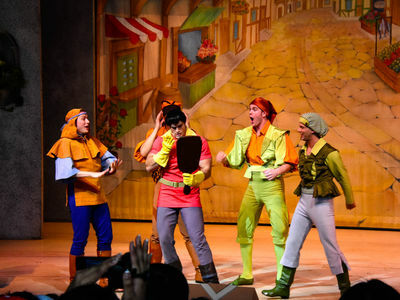 Here, Gaston admires himself with his loyal followers from the village. Photo by Donald Fink. 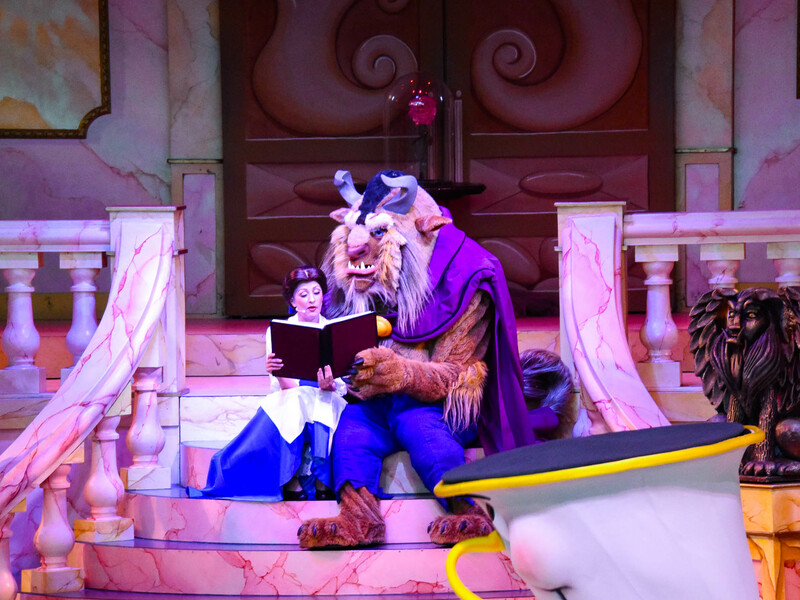 Belle and the Beast share a book in the stage production of Beauty and the Beast. 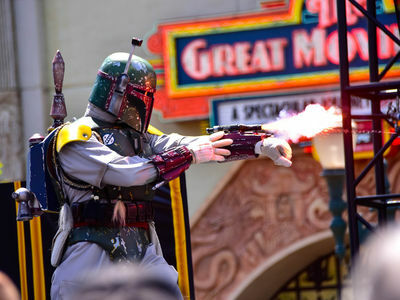 This show runs daily at The Theatre of the Stars, located at Hollywood Studios, Sunset Boulevard. Photo by Donald Fink. The Rock 'n' Roller Coaster is at the end of Sunset Boulevard to the left as you approach the Tower of Terror. It features a thrilling roller coaster ride themed around a race to attend an Aerosmith rock concert. Photo by Bonnie Fink. 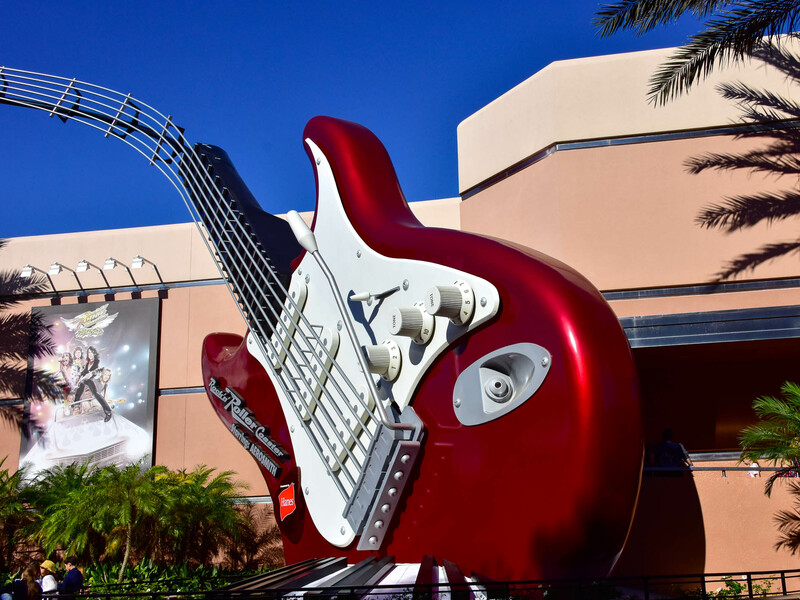 Rock 'n' Roller Coaster represents a ride through southern California in a limo as you head to an Aerosmith concert. The ride accelerates from 0 to 60 in about 2.8 seconds as you blast up a ramp to your first loop. It inverts two more times during the ride. On this past March 27, Steven Tyler—the lead singer for Aerosmith—visited Hollywood Studios for his birthday just to check on the ride. Our information is that he occasionally visits Hollywood Studios on or near his birthday for that purpose. As you walk along Hollywood and Sunset Boulevards, there's a good chance you'll run into some characters that look and act like they're straight out of Hollywood in the 1940s. Most of them are from the movie industry, but you can also encounter policemen, utility workers, and so on. These folks collectively are called The Citizens of Hollywood. They show up, unannounced throughout the day and provide a short show for about fifteen minutes, usually interacting with the guests. 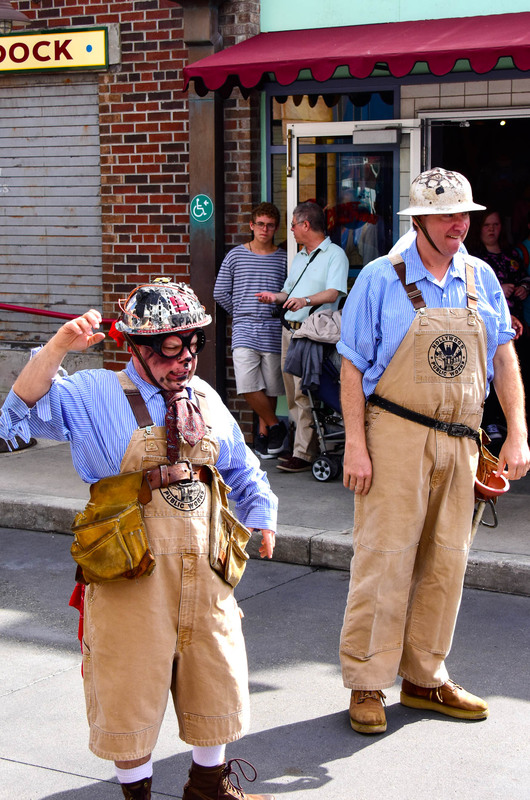 When you see these performances along the street, it's easy to simply walk around them and move along to wherever you were going, but we recommend that you take a moment and watch these talented people. We've found that their characters are spot on, they're entertaining, and they've become part of the reason we come to Hollywood Studios. 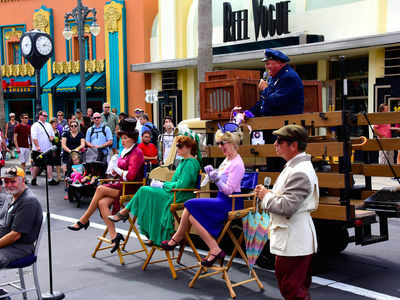 In a Hollywood Studios version of the Dating Game, some of the Citizens of Hollywood try to entice a guest. From left to right, the Citizens are, Dora Vamp, Mimi Kaboom, Evie Starlight, with famous Italian director Alberto Dante. Above in the bed of the truck is Officer William Club. Photo by Donald Fink. Hollywood Studios Citizen Dorma Nesmond takes time from her glamorous day to pose. Video by Donald Fink. Sparky Sparks and Frederick Lewenowski are loyal Public Works workers for the mythical 1940s Hollywood. Sparky is, of course the electrician and Fred, well, he's good at setting up traffic cones. Photo by Donald Fink. 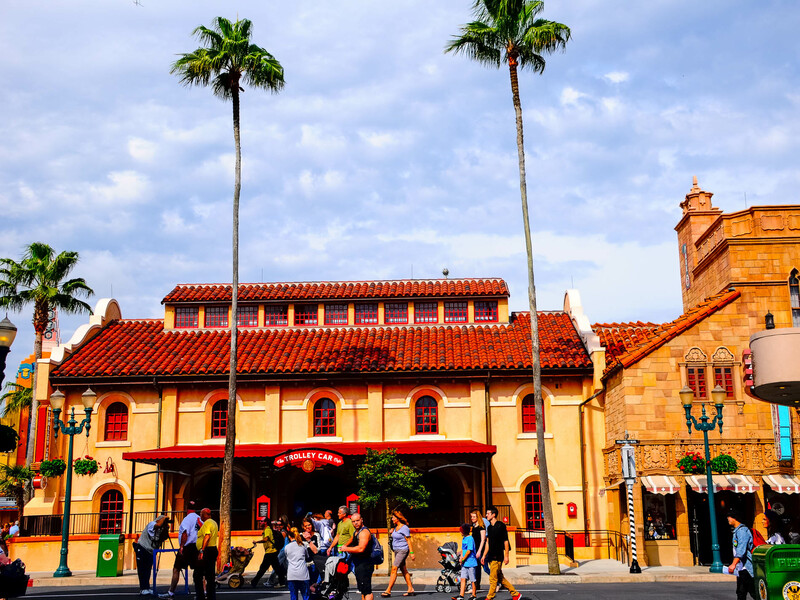 These images represent just a small portion of the entertainment you can find on these two streets of Disney's Hollywood Studios. When you come to Walt Disney World, we think you should plan as much time here as you can. Your efforts will not go unrewarded. The original Hollywood Bowl is not located in Santa Monica. It is on Highland Blvd north of Hollywood Blvd about 13 miles from Santa Monica or about an hour depending on traffic.